“As close as you get to the Everglades.” Thus spake the lady and, by the time she uttered these words, I was wondering just how good it was. Heck, judging by the number of binoculars and cameras with obscene lens, it had to be good. I’d finally found Circle B Bar Reserve after I used a street number off Trip Advisor that turned out to be around 8 kilometres short and, after I asked someone, was told it was the next traffic light and turn left. Sounded good except it wasn’t down that road, it was the second lights I should have ventured to. All of which set me back about half an hour but, hey, I’d arrived at last. I chose here because someone on the internet suggested the wildlife was fairly abundant. That, and the fact that it seemed not that far away, set me out in my first quest for Florida nature and, as I drive in through the sphagnum-moss-laden trees, you can’t help but get the feeling that you’ve arrived. The carpark was ample and around five chemical toilets were adjacent. I’d only just gone past them when it was hard not to notice about two dozen people gawking up at a tree. Binoculars and cameras all pointed in the same direction so I enquired as to what the excitement was about. 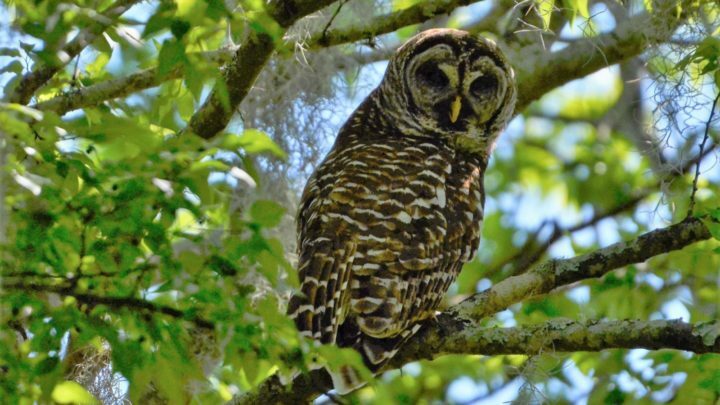 “Barred owl,” came the bug-eyed reply. Indeed there were a couple of said owls, but you couldn’t get a decent angle on them. I figured you needed to hike about 10 metres into the knee-length grass to get the right angle and wondered why no one else was over there. Oh well, off I went, was about to take a snap when Mr Pedant said I wasn’t allowed to do that. Apparently going off piste is verboten! I meekly returned to the group thinking I’d wait for them to move on and then have another crack but, hardly anyone broke ranks. The paths are easy to follow and you can’t get lost … unless you leave the trail, which you’re not allowed to do. I’ve been friendly to a few twitchers and they’ve reciprocated and bird sightings are readily shared. 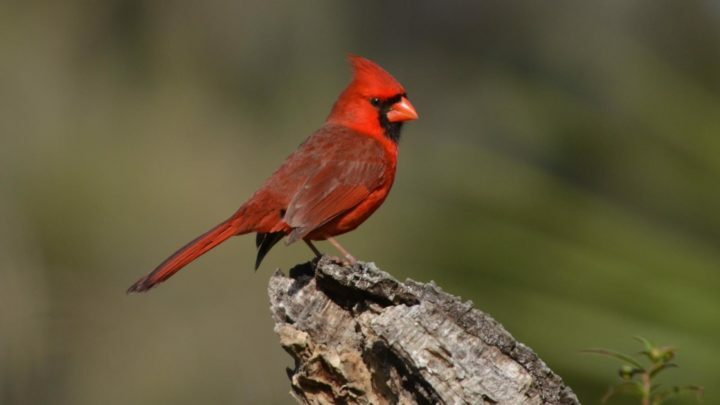 Thus it is that I see my first cardinal, a bright red/orange bird that I get excited about, but the twitchers are almost bored because they’re fairly common apparently. One twitcher who had similar equipment to me said he took 3,000 pictures in a day. That put my record of 900 into perspective. Apparently he’s after birds in motion and does multiple shutter clicks while they’re in flight. There are also dragonflies everywhere, I’ll see hundreds before the day’s out but it’s hard not to note that I’m the only one bothered with them. Wherever you walk, water’s not too far away, and it’s that which supports the wildlife. I mean, if you glance out across the swamp, there’s not a lot happening. It’s when you stop and watch for a minute or two that you realise just how much life there is out there. 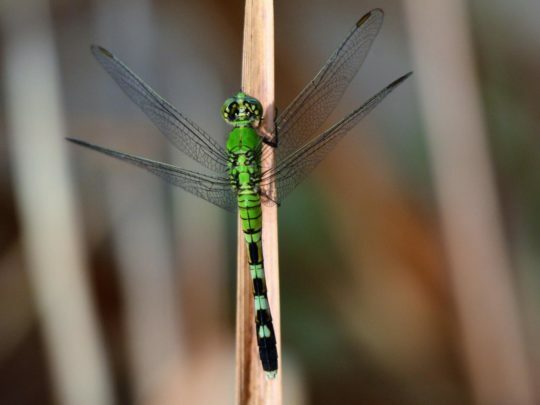 Fish constantly flick the surface, birds wade through the plants, squirrels scurry up and down the trees, often at times when you’re least expecting it (much like the lizards), dragonflies dance on the tips of sticks and raptors constantly soar overhead, and sometimes not. I’m startled when a golden eagle speeds across the track at eye height with a large fish in its mouth only 15m in front of me. Wildlife? It’s right here, right now. Earlier there’d been an osprey on a distant dead tree branch ripping one apart but it wasn’t up close and personal like this. Then, of course, no walk here would be complete without seeing an alligator and I spot my first one, though it’s only just out the egg, basking right next to me. Well, it was around two feet long but not really what you hope to see. A larger one slid ominously further out in the pond, but it wasn’t anything to get excited about either. I move on, the heat and humidity starting to take its toll, even though it’s only around 9:30am. The trail is flat, just like all of Florida actually. I stop at a shady crossroads with seats and pause for refreshments, blissfully unaware that the biggest reptile I’ll see all day is about 20m away on the other side of a mound. It will be 45 minutes before I come across him. I head out again, into the world of grackles, limpkins and gallinules, none of which I’ve seen or heard of before. It pays to pause, because much of nature is stagnant and there’s a lot of it to see for the patient eye. When I reach the end of a shady lane I turn back, not wishing to swelter anymore and when I get back to the intersection someone sends me right to where they just saw a ‘gator. I move 50m up and get a shot of its upper bits then turn around and head back and, bingo, there it is, the biggie I’d missed earlier. They’re not frightening like estuarine (saltwater) crocs, but a little more ominous than Johnson River crocs and they have a presence in this place where dog eats dog and ‘gator eats ‘gator. There’s a famous photograph online of a big one chomping on a medium-sized one of his brethren at this very location. I’m not scared, but I wouldn’t want to upset him either! I’m sated now and slowly move towards the carpark, getting lucky twice on the return. First up it’s a mum with a little alligator on her back and another two beside. They’re much brighter and look like snakes almost. Then, when I get back beside the toilets, the owls have moved to a much more accessible spot and I manage to get 5m off the trail without chastisement and nail one, giving him a bird call so he’ll face me. I’m over the moon, and stuffed as well. It’s past midday so I’ve been out there around four hours and the air-conditioning in the car is such a relief. I reflect on what someone had said, “This park is a lot more friendly than others. People talk to you, take their time and share their finds, unlike other places”. I had to agree, even though I haven’t been to the others yet. When have you been ‘up close and personal’ with wildlife on your travels? Do you enjoy animal encounters while travelling? Been travelling? Travel at 60 wants to publish your story. Simply sign up as a contributor and submit your stories. When your story is published, you’ll go into the draw to win some great weekly prizes. You can also join the Travel at 60 Travel Lovers Club on Facebook to talk to other travellers in the Travel at 60 community.